Jamie is a wildlife enthusiast who loves the outdoors. He graduated from North Carolina State University with a degree in Turfgrass Management. He currently owns Pinestraw Headquarters, LLC, which specializes in managing long leaf pine plantations for the harvesting of pine needles. The pine needles are sold for decorative mulch for residential and commercial properties. His hobbies include whitetail deer hunting, duck hunting, and tournament bass fishing. He also enjoys putting in food plots and managing the properties he hunts, which gives him great experience when helping a client buy or sell recreational property. He can easily look at a property to know how to make it a desirable hunting tract to sell or buy. 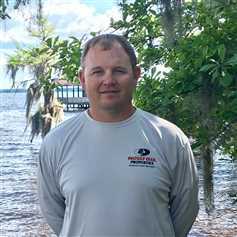 Jamie resides in Lake Waccamaw with his wife, Kristin, and two beautiful daughters, Kynleigh and Kamryn.